Place a dumbell across your shoulders. Your elbows will be facing straight ahead with your fingers on top of the dumbell. Execution: With the back of your heels placed against the box, sit way back onto the box. Do not round your lower back. Keep a flat and tight lower back position. As you sit on the box, relax your hip flexors but keep everything else tight. From this position jump as hard and fast as possible straight up pushing the weight overhead. Reset after each jump. Attach the band to a stable object behind you. Take an athletic posture. Bear crawl as fast as you can, focusing on extending your hips and knees to strengthen your posterior chain. 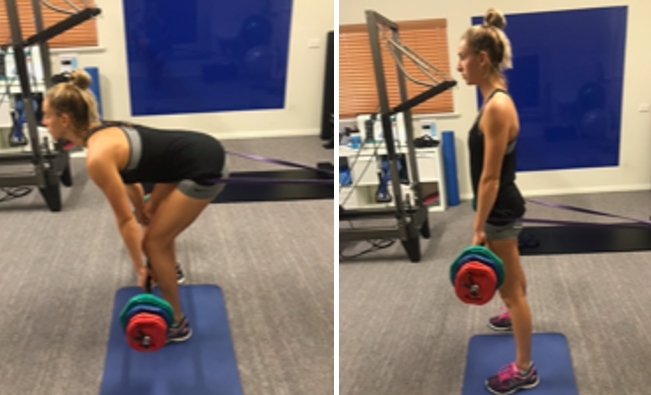 Banded drills can be done for conditioning, fat loss, muscle building and sport-specific training. It works every muscle in your body. Bear crawl as far out as the band will allow you too, then bear crawl backwards. Repeat forwards and backwards. Place a towel/socks or sliders on the floor and get into a plank position with your toes on the slider. Plant your forearms onto the floor with your elbows directly underneath your shoulders. Contract your abs throughout the movement to ensure your hips don’t sag. If your hips do sag in the during the movement, you’re taking the range of motion too far. Squeeze your glutes, hamstrings, and quads throughout the exercise. Push yourself back with your forearms and elbows to slide back, then return to starting position. That counts as 1 rep.
Take a shoulder width stance and point the toes straight ahead. Execution: Drop straight down into a squat position with the dumbell resting in your hand a few inches off of the ground. When ready, forcefully jump and extend up. Then, drop straight down into the starting position. Catch the weight with your arms fully extended in the bottom and top position. Stand up with arms extended until you are upright. Start with a lighter weight then once you are comfortable with the moment you can increase more weight. Before performing this exercise, please note that this exercise is considered to be an advanced exercise. Place the top of one of your feet on top of the box. Your head should be looking straight ahead. Keep your abdominals tight breath in as you bend your front knee to lower your body down as far as you can. Keep your shoulders back and chest out. ( This is the starting position) Forcefully drive from the heel pushing your body up. Create enough momentum that you perform a small jump. Quickly lift your foot, once your foot is in the air try and touch your glute with your foot. This is an awesome exercise if you want to increase your power. Attach a band to a stable object. Start by looping the band around your hips (face away from where the band is anchored) Take the weighted bar and start by lowering the weight down by keeping your knees slightly bent and as you feel your hamstrings working, stand up and push your hips through. Pause in this position and make sure that you feel your glutes working. Lower the weight back down and repeat. Place a bosu ball on the floor turned upside down (Make sure the bosu ball is secure and it will not move whilst doing the exercises.) Jump laterally on a bosu ball with your left foot – keeping your knees slightly bent. Then jump laterally on the ground with your right leg, keeping your balance then jump back onto the bosu ball. Lie on your back with your right foot resting on the bosu. Hold a suitable weight in your right hand. When you are in position you are going to push your hips up to the ceiling using your right leg only. Then when stable extend your opposite arm(with the weight) and opposite leg and bring them together. Attach the band to a stable object. Place the resistance band around your hips so that you are facing away from the band. Take a step or two away from the band so that the band is pulling you towards to where it is anchored. Jump side to side, stabilizing yourself on the leg that you have just landed on. Pause for a second then jump to the other side. Put socks on before using the slider board. Stand with one foot on the ground and the other foot on the slider board. When ready, lower the back leg down into a lunge and then slide the back leg up again. Tighten your glutes. Keeping back straight. Put the socks onto increase the “slide”. Take an athletic position, by bending your knees and having a slight lean of your torso. When ready, slide from one side to another keeping your balance. As soon as your foot hits the foam slide to the other side. If you are doing it correctly you will feel it in your glutes, hamstrings and quads. Put the socks on. Start in a plank position, with arms and legs long. Pull your right knee into your chest , quickly switch and pull the left knee in. Continue to switch from leg to leg.When you are comfotable with this, you can keep your legs together and do the same movement for a variation. Do not round your back. Repeat for 1 minute. The slider will increase the difficulty of the exercise, so start on the ground and then build up to this. Take an athletic position. Drag the ball from the left to the right, keeping the ball on your stick.